Project title: Volcanic phenomena in Roman antiquity. Discursive formation and literary construction. Due to the Mediterranean's plate tectonics, volcanic phenomena could be encountered quite often in the cultural region of ancient Greece and Rome. 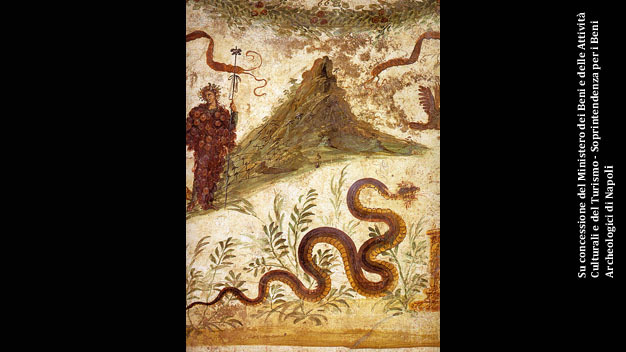 Their form of appearance varied from almost innocuous phenomena like fumaroles, which are characteristic of the Phlegrean Fields, to phenomena of a disastrous extent, like the fatal outbreak of Vesuvius in A.D. 79. Literary accounts of such phenomena are frequently seen in antiquity as well. They occur in natural history texts, philosophical and architectural writings, historiography and letters, as well as in epic poetry, hymns, tragedies, didactic poetry and epigrams. These regresses range from shorter, incidental references (like metaphors or comparisons) to longer descriptions of the phenomena, their causes or the human ways of handling them, being significantly influenced by literary genres, contemporary aesthetics and existing discourses. Among these, the categories according to which phenomena were classified are especially important. This research will ask, supported by historical discourse studies, how these phenomena are presented in literature and which discourses take influence on them. A special eye will be given to questions considering historical disaster research focusing on the human positioning towards such phenomena. Therefore, it shall also be asked which phenomena were (or were not) recognized as volcanic, at what time and according to which categories they were classified as phenomena, natural forces or disasters and which human (re)actions can be seen. Archaeological finds and environmental research will therefore be regarded as well. Roman literature will be the main subject and focus of this study, but Greek pretexts and concepts will be considered as well. Based on the categorical taxonomies and literary pictures of volcanic phenomena that are found, ancient concepts of nature can be figured out as well, showing concepts of readability or (un)controllability of such phenomena through mankind. Whether these concepts are universal, local or transferred shall be tested by looking at comparable concepts of fire, earthquakes or volcanism in (ancient) oriental societies.